A common conversation I find myself having with family and friends is about how quickly time is passing. With the threat of Hurricane Florence recently, my husband and daughters were off of work and school for almost a week. Looking back at that week when it was over, my husband and I talked about what we did (and didn’t do!) with that unexpected “free” time. He shared with me this quote from legendary basketball coach John Wooden. I’ve been thinking about that ever since. It’s so easy to just let a day go by without being intentional about how you spend it. We can purposely fill our hours with what’s important to us, or we can just let the day drift by with no purpose. Obviously there are certain tasks that must be done. But even in those daily must-do’s, we can choose to focus on making the hours meaningful. 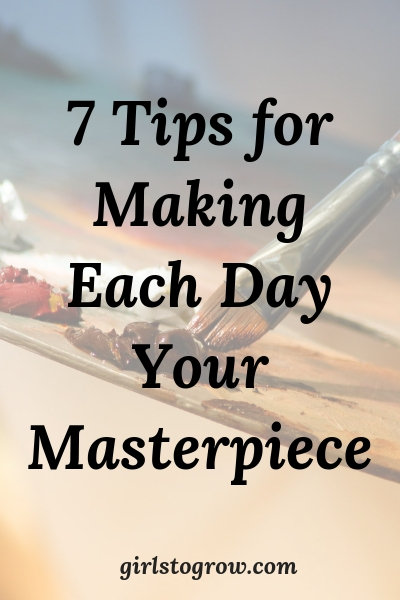 Here are seven ways we can work to create a masterpiece each day. 1. Remember that a masterpiece is made up of many small strokes. Here and there we have days with big, bold wins. You get a promotion at work, receive a random, heartfelt note of love and appreciation from your teenager, or finally meet a longstanding personal goal. But most days are full of lots of little strokes. Things like rocking a baby to sleep, slipping a love note into your husband’s pocket, or lighting a candle while you clean up the kitchen after supper. Maybe you listened to a play-by-play account of your son’s school day, played Candy Land for half an hour, or wrote out a Bible verse to post on the refrigerator door. None of these tasks seems like a big deal. But put them all together, and those little moments become the building blocks of a life well-lived. I’m not a five-star chef nor the most efficient housekeeper, but I can get a healthy meal on the table and run that vacuum cleaner with the best of ’em! 3. Realize that God’s given you the skill to produce something beautiful. He gave you a spouse to encourage and made you the parent of your children. You are His creation and lovely in His sight. Yes, you will sin and fail, but He will forgive and restore. You were created for a purpose. As long as you’re here on the earth, there is something meaningful God wants you to do. 4. Be kind. A masterpiece can be marred by ugly strokes. One day last week, I got angry when another car cut me off in traffic. I was frustrated and blew my horn – then hoped no one I knew was around because I was so embarrassed! I’m not saying there’s never a time to blow your horn, but I just let my frustration get the best of me. We teach our children Ephesians 4: 28, and it sounds so simple. “And be ye kind one to another…” But I definitely need the Holy Spirit’s help to live that out every day. 5. Take time for God. It sounds so basic, but isn’t getting to know God better about the most important thing we can do today? Carve some time out of your day to find a truth about God to meditate on. I’ve started using a daily audio Bible app on my phone so that I can hear the Bible read out loud. Since I’m already in the habit of listening to podcasts, this fits right in to my day. It’s just another way to take in God’s Word. 6. Use your time wisely. I don’t think this means every moment has to be full of stuff to do. It can be extremely life-giving to sit on the porch and watch the sunset. But surfing the Internet mindlessly or sitting in front of a television for hours can leave you feeling empty, knowing that you wasted time. 7. Focus on right now. You can’t change the past. You can’t foretell the future. Set goals and make plans, but do what you need to do today to grow in your walk with God and show love to others. God gives us a blank canvas each morning. Let’s fill it today with beautiful brush strokes, for His honor and glory. I hear a lot about them these days. Frequently, on podcasts I listen to, the host or guests will proudly proclaim that they’re an Enneagram 7 or an ENFP. And I’m certainly a fan of learning not only what personality type you are, but also the personality styles of those around you. Better understanding our children’s personalities has guided my husband and I as we instruct and discipline them. We know that one daughter responds best to clear, direct communication. She doesn’t care about a gentle approach, nor does she have time for long-winded explanations. While I’ve taken a personality test before, I didn’t need one to tell me that I’m an introvert. I enjoy being around people, but I recharge by having alone time. And when it comes to entering new social situations, I have to force myself out of my comfort zone. Now, if you’re an extrovert, you may not relate to anything in this post, but perhaps it will give you insight into how the rest of us feel! If we’re going to a social event, most of us realize that it will be more enjoyable if someone we know is going to be there. There’ll be someone to talk to, and we won’t awkwardly stand around looking lonely. And that’s all fine and good. But sometimes good things happen when I’m a little uncomfortable. Several months ago, I attended a wedding with my daughters. There was a fairly large crowd, and we knew some of the guests. 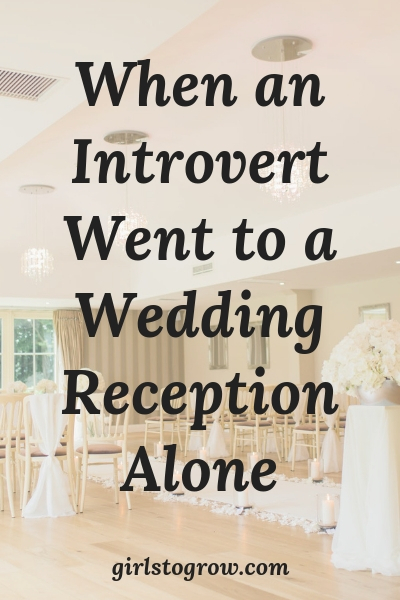 When it came time for the sit-down dinner reception, my girls split off with friends, and I was on my own. By the time I got my food from the buffet line, many of the tables were full. In the large room, I didn’t want to wander around looking for someone I knew in hopes that there was an empty seat at their table. I spotted a table with a few empty chairs, and just sat down by myself. On impulse, I introduced myself to the lady on my left. She was a friend of the groom, was from out-of-state, and we ended up having the most interesting conversation! This woman was an elementary school teacher (which I used to be). She also happened to be from the area where I attended college. We talked and talked about all kinds of things, and didn’t leave the table until it was time to say farewell to the newly married couple! Sometimes, if I know I’m going into a situation like that, I try to remember to pray and ask God to lead me to just the right person He would have me interact with. It might seem like a small request. However, I believe that God will put me in the path of someone I can fellowship with. Even when people I know are around, it can be a blessing to reach out and make a new friend. So the next time we introverts head into a new social situation, let’s ask God to lead us in where to sit or who to talk to. This incident made me want to be more mindful of noticing someone who doesn’t seem to have anyone to talk to. Rather than focusing on my own pleasure, I can see if there’s a person nearby who could use some conversation. You never know when you might make a new friend ~ and get a blessing for yourself in the process. 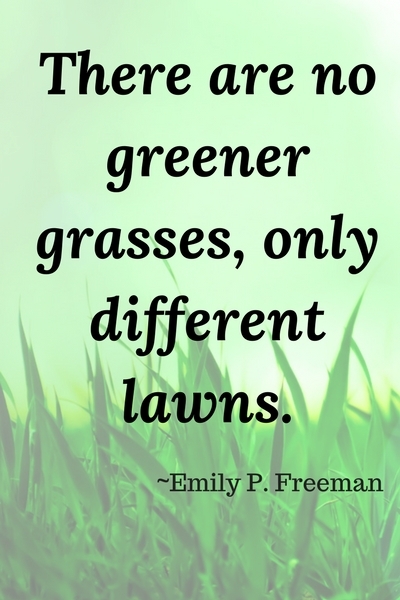 You’ve probably heard the old saying, “The grass is always greener on the other side of the fence.” It reminds us that while someone else’s situation may look better than ours, that’s not necessarily the case. Looking across the fence at someone else’s yard, we see only the positives. Their grass is healthy, lush, and green. We glance down at our yard, and notice the brown patches and weeds. In our own yard, we see only the negatives. We see the mom with her well-behaved children, especially the teenage daughter who seems to adore her. (Okay, that’s what I notice these days, ha!) Her house is decorated, inside and out, in a Pinterest-perfect way. And not only does she homeschool her children, she also manages a non-profit, brings homemade desserts to every church potluck, has weekly date nights with her husband, and runs five miles a day! Then we look at ourselves, breaking up fights between our children as we throw peanut-butter-and-jelly sandwiches into a plastic grocery bag for our kids’ school lunches. Dirty dishes are piled high in the sink as we herd everyone to the car. The laundry basket is overflowing, we’re driving to school in our pajamas, and the only exercise planned for today is scrubbing the shower. We may think that other mother has it all together, but I can pretty much guarantee that’s not the case. Her life, from the outside, may look perfect, but she’s likely struggling, in some way, as we are. I’ve previously written about comparison, and the dangers that come with it. Yet it’s good to be reminded that each of us is planted in a different place. God has put each one of us in the exact situation with the specific set of circumstances He wants us to have. Do our foolish choices sometimes impact that? Yes. But God is bigger than our mistakes, and He can grow us exactly where we are. When we’re tempted to think that someone else has an easier life, a more loving husband, or better-behaved children, chase those thoughts away. Don’t let comparison make you feel that others are so much better off than you are. The opposite can be true as well. For example, we may look at a parent who has a disabled child and think, “How hard their life must be.” Yet God can give them the grace, peace, and joy they need to flourish in that relationship. They may experience far more blessings than we could even guess. None of us can see from our current vantage point what God is doing in the lives of others. Just like He has a plan for us, He has a plan for them, too. Instead of wanting someone else’s lawn, let’s accept ours. Let’s thank God for what we have, then set about to accomplish His purpose right we are. Be content. 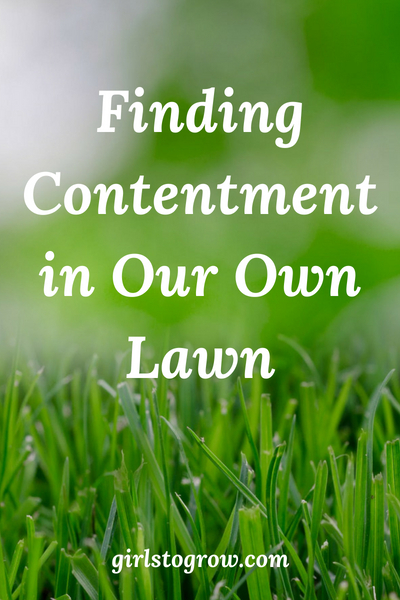 Get so busy cultivating your own grass that you don’t have time to focus on how your neighbor’s grass is growing. With God’s help, do the best you can in every area of your life. Then trust God to make your “lawn” all that He would have it to be, for His honor and glory. 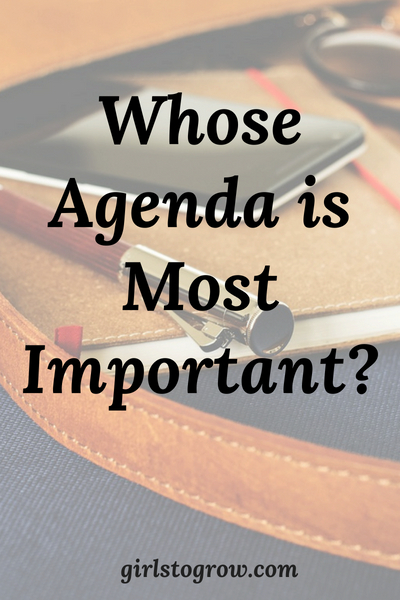 Whose Agenda is Most Important? While the actual summer season isn’t over yet, the way I refer to summer is. 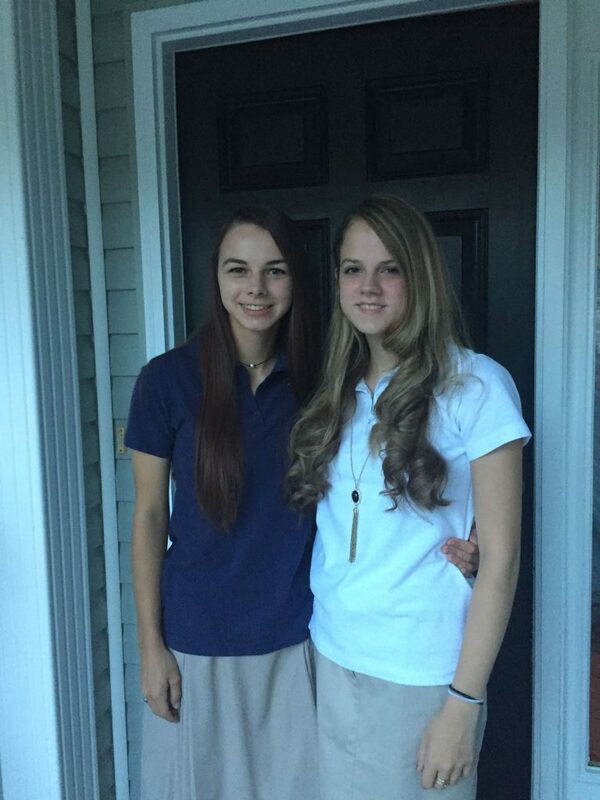 Our girls went back to school yesterday, one as a high school senior, the other a high school sophomore. Like many moms, I was asked if I was ready for the kids to go back to school. The answer was no. It takes a couple of weeks for us to gear down at the end of a school year, but once we get into summer, I like it. I enjoy having the girls around at random times of the day, staying up late to watch a movie, sleeping in a bit, and not packing lunches. But here we are. And routine is good. And by this time next week, we’ll be back in the swing of things, crazy as it’s likely to be. As I thought about what I wanted to keep fresh on our minds this year, I kept coming back to the word “focus.” According to the Oxford dictionary, focus means “the center of interest or activity.” From sports to academics to friendships, what do we want our lives to center on? And, by the way, whether we’re involved in any back-to-school related things or not, our daily focus matters. I chose a very familiar verse to challenge us. That’s it. For our girls, for me, for all of us, seeking God’s will and His righteousness should guide us in every thing we do. If we focus on seeking God, our decisions, priorities, and relationships will fall into place. 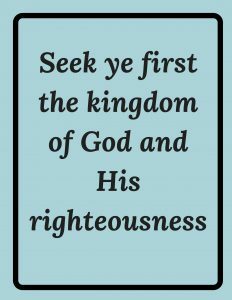 Seeking God first means putting selfishness aside. It means patience when things move too slowly for our liking, because we trust that God is sovereign. We seek His glory, not our own, in our pursuits. And it’s valuing what matters in eternity rather than the temporary pleasures here. So as my girls go through their school year, I hope to keep that as our focus. May we start each day desiring to find His plan for the day and follow it. If our to-do list needs to go by the wayside so that we can spend time with a friend who’s hurting, so be it. If God’s timetable doesn’t match up with ours, let’s rest in His timing. Anything we can accomplish that brings glory to God and lasts for eternity will fall under that heading of seeking His kingdom first. And I’m a day late, but now I’m off to make a sign to put on the door for my daughters to see as they leave each morning! What Does It Mean to Delight in the Lord? So remember last week’s post, the one about trusting God to orchestrate our days? That published on Friday morning. The same Friday morning that we headed to the airport for a 7:40am flight to Chicago, where our family planned to spend a four-day weekend for our summer vacation. We checked in with plenty of time to eat breakfast before we boarded the plane. We got settled in our seats, and all appeared to be well. Until they deplaned us. There apparently was a leak in the cockpit, which, since it was raining, could lead to instruments in the control panel shorting out. Not good. The captain gave periodic updates as we waited in the gate area, saying they’d found the leak, but were having difficulty sealing it. Then they weren’t able to maintain pressure in the cabin, another important concept when you’re tens of thousands of feet up in the air! They finally canceled our flight just before noon, and we were able to get tickets for a 3:30pm flight. We left the airport to get lunch…and just as we got back to the parking garage, the “bad” news started coming in. The new flight was now delayed due to thunderstorms between us and Chicago. So back into the airport we went…and continued to be delayed. We finally boarded the plane around 6:00pm. And yes, my husband noted the irony of the post I’d written, and the way our day unfolded. It was NOT how we would have orchestrated it…but what a great chance to live out the truth of what I’d written. And, as always, there are lessons to be learned. 1. God is in control. I am not. How many situations do we face every day that we can’t control? Another person’s reaction, the weather, the traffic, how quickly the checkout line moves…the list goes on and on. Every one of these situations is a chance to recognize God’s sovereignty, and to submit to whatever He has willed for us in that moment. 2. There is always, always, always something for which to be thankful. Here’s a short list from last Friday. ~They deplaned us quickly on learning there was a problem with the aircraft. 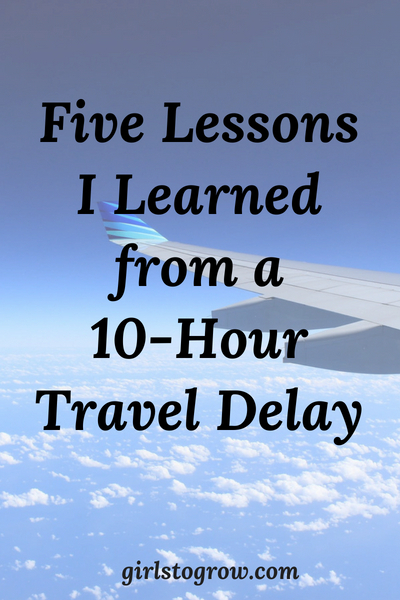 There was no sitting on the plane for a long period of time. ~We all kept fairly good attitudes throughout the long day. ~We were traveling with teenagers, not toddlers. Trying to entertain little ones for all those hours would have been a struggle! ~Our girls showed us the Game Pigeon app, which let the four of us play Crazy 8s together on our phones while we waited. ~We were upgraded on our afternoon flight, so had more spacious seats, and free Direct TV for the flight. 3. Don’t take your frustrations out on other people, especially those who, like you, have no control over the situation. One passenger in particular was venting his frustration over the delay to the gate agent. My husband remarked to me, “Does anyone think the pilot or these airline employees got up this morning hoping that this flight would be canceled?” No way. They were as eager as we were for everything to go as scheduled. But it didn’t. And there was nothing they could do to get that plane in the air any faster than what they were already doing. 4. Laughter is good medicine. If you’ve never visited the Charleston airport, let’s just say that it’s small. Not a lot to entertain yourself with if you’re stuck there for awhile. However, on one of our strolls through the terminal, our 15-year-old and I walked through a store looking at what they had for sale. She grabbed a joke book from the shelf, and began reading jokes aloud. Admittedly, we’d been up since around 4:30am, so were a bit on the tired side and easily entertained. Regardless, the jokes made us laugh, and left us a little bit happier. 5. It’s okay to just trust that God knows best, without having to know or understand the reason why. I can’t tell you what purpose God had in delaying our travel plans by ten hours. As far as we know, there was no life-changing impact on people around us. I can’t say that we avoided some major catastrophe. The bottom line is that hanging out at the Charleston airport is just what God had for us that day. So my best option was to make the choice to trust His plan, and move on to the next thing. All of this being said, maybe I should be more careful what I post about the next time we plan to leave town!! My teenagers aren’t always (if ever!) sitting around waiting to soak up any parental wisdom that comes out of my mouth. They’re more likely to be too involved in what’s going on in their own lives to let me “bless” them with my advice. But on the off-chance that they want me to share a bit of knowledge with them, I decided to be ready. I rounded up some quotes that are short, sweet, and to the point, yet pack a powerful punch. It’s ten pieces of life advice to help them navigate the coming years with a healthy perspective on what’s truly important. The more we know about God – His goodness, love, and mercy – the easier it is to trust Him with our future. That future could be as close as tomorrow, and as far away as eternity. Don’t spend your time wishing you were somewhere else or with a different person. In other words, live in the moment. Instead of longing for the past or wishing for the future, embrace the exact circumstances God has placed you in today. This ties together contentment and gratitude, two of the most valuable traits a person can have. When we place too many expectations on a person or a particular circumstance, we’re often disappointed. And living with a grateful heart will keep us focused on how blessed we are. This is the quote that led me to write this post. 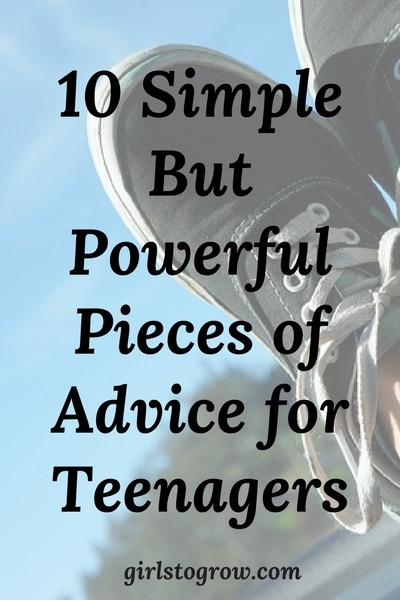 Teenagers especially can make decisions that feel good in the moment. But if they will take the time to think about where the consequences of that decision might lead, they can determine if it’s a wise decision or not. I find myself needing this advice, though I’m supposedly older and wiser! From the words I say to the things I do – if I’ll look back tomorrow and wish I hadn’t said or done it, I shouldn’t do it in the first place. We’ve found that experiencing events together as a family is usually much better than giving physical gifts. We’ll always have great memories of outings and travels that we’ve had during these years of our children living at home. I hope we’re passing on to them a love for sharing adventures with those closest to them. My dad exemplifies this one. He is just as interested in talking to and getting to know his car mechanic as he is the VIP of a Fortune 500 company. Strive to learn something from each person that you meet. Humility and thoughtfulness are qualities that seem rarer than ever these days. Smile at people. Thank anyone who does the smallest thing for you. Just notice other people, and go out of your way to make them feel special. Prioritize people and relationships over work. Let the to-do list go at some point in the day, and just enjoy being with your people. Hopefully I can continue to work these ideas into future conversations with my teenagers. If you have any bits of life advice you’ve found helpful, share them with us in the comments! It’s clichéd, but true. Life is made up of seasons. This is on my mind as we rush headlong toward the end of another school year. Come fall, my oldest will be a senior in high school. One season, at least with her, will slowly be coming to an end. It will be a year of “lasts” – last first day of school, last high school basketball game, last choir competition, last band concert. Sometimes you don’t see the change of seasons coming as clearly as this one is. Just like in nature, some seasons change gradually. You hardly recognize that one is over and another has begun until you look back. I’ve always loved Ecclesiastes 3 where Solomon talks about the seasons. My husband’s been teaching out of this book of the Bible in our Sunday School class recently. It got me thinking about some lessons that might be helpful as we face different transitions in the future. Most things in life – both blessings and trials – are given to us for a season. Friendships, opportunities, the flexibility of our schedules, and our health change from season to season. What we enjoy in one stage of life may not be available to us in the next. God uses seasons to change us into what He would have us to be. If life always ran along smoothly and we knew just what to expect, our faith would never grow. God wants to make each of us into a beautiful masterpiece by weaving into our lives those trials that will refine us. And, of course, it’s important to remember that He works in His timeline, not ours. I’d like to get through any of those painful growing stages really fast, but He knows just the pace at which I need to grow. Only God knows how each season will play out. Where is our daughter going to go to college? How different will we be as a family of 3? God has all the answers. He knows before I do how it’s all going to work out. We just need to ask for His wisdom, and allow Him to guide us. God wants us to find and enjoy the best in every season. God has given us so many blessings to enjoy. From sweet friendships to glorious sunsets, good food to beautiful places to visit, we’re surrounded with things we can appreciate. 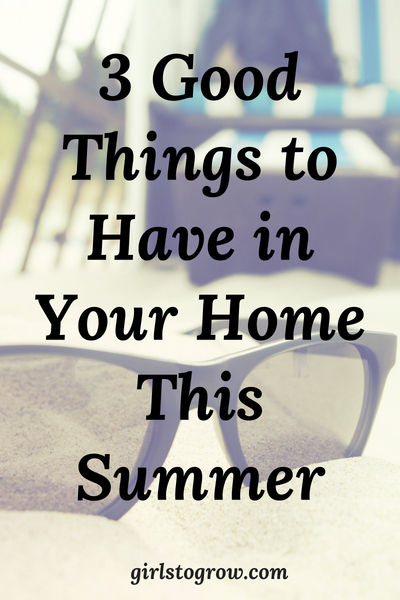 No matter what season you’re in, look for small – and large – things to take pleasure in. That “happy hello’s and sad goodbye’s” is a quote from my mom. Since we live a couple of states away, she and my dad are always excited to see us come for a visit, and then a bit sad every time we leave. 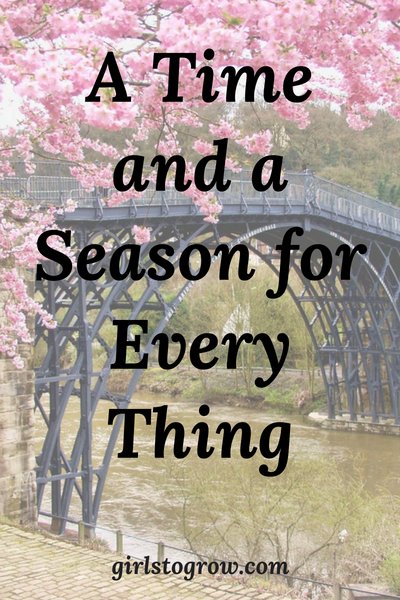 In the same way, every season has its joys and sorrows. It’s that way with my daughter graduating from high school next year. It’s bittersweet. I’ll be sad over what’s ending, yet very excited at what God has ahead of her. Surrender each season to God. Our God is sovereign. He is in control of every facet of our lives. As we begin to surrender to Him through the hard days as well as the easy ones, we’ll learn to trust Him even more. So whatever season you find yourself in today, I hope you’ll embrace it for what it is. Enjoy the good parts, learn from the tough days, and remember that God has a purpose in all of it. Age gives you a different perspective on a lot of things. When I was younger, the start of a new year was all about the possibilities ahead of me. What goals could I accomplish? Could I lose that ten pounds, get up at 5am every weekday, read 100 books in twelve months? So much potential for exciting things to happen! To a degree, I’m still that way. I’m a planner. I like to look ahead, and see exciting things on the horizon. I enjoy the anticipation that comes from a fresh start, a clean slate. Yet the years have infused my thinking with perhaps a tinge more realism. I’m not trying to be a “Debbie Downer,” but I think we get to the point where we’ve lived long enough to know that trials are part of life. None of us are exempt from them. I realize that March could bring a car accident, May might mean a serious sickness for a family member, we could face a big job challenge in July. 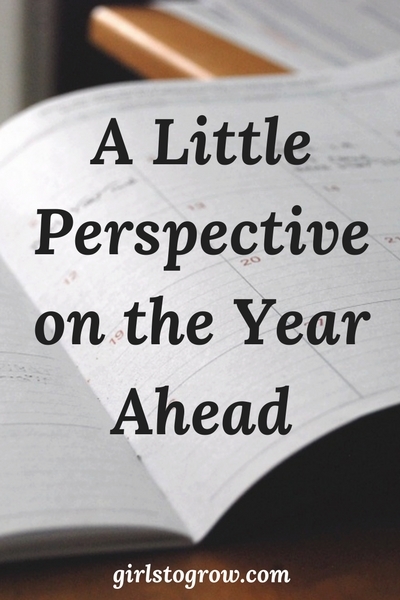 There’s a lot in the year ahead that could make me apprehensive and even fearful. As I was having some of those thoughts earlier this week, I came across this verse. In context, it’s talking about spiritual blessings. We can’t even imagine the mercy and grace, peace and joy that are available to us as we walk with God. His Spirit reveals truth to us as we spend time in the Bible. We get wisdom and discernment as we learn to live in that truth. How I want those spiritual blessings this year! Those moments when I sense God speaking to me through a Bible passage I meditate on or a sermon I hear at church or a song that resonates with my current situation. I want to recognize His hand at work through answered prayer, realize victory over a sin I’ve struggled with. How sweet are those precious times! Could the verse above also apply to endless treasures stored up for us in heaven? I certainly believe so! I don’t think we have any idea how glorious our home in heaven will be. Jesus is preparing a place for us that will delight His children. But could the verse also have application to what God has ahead of me in 2018? I think it could. But are there also going to be some sweet, unexpected blessings that come into our lives? I totally believe that, too! There will be deep conversations with friends, a heart-to-heart talk with a daughter, the realization of a goal that my husband has worked toward, a celebration of answered prayer that’s been a long time coming. In little ways and in big ones, God has blessings in store that we wouldn’t even dream about today. So as we finish up this second week of January, let’s focus on the blessings ahead of us. Let’s have a heart’s desire to get some of those sweet times with our Lord when He refreshes our soul. Then let’s go ahead and praise Him for all that He’s preparing for us, both in our lives here during 2018 as well as for all eternity. 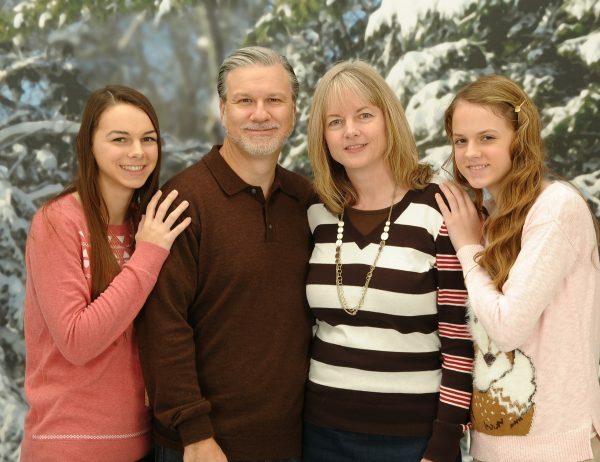 From our family to yours….Merry Christmas! !